All Guest Internet hotspot gateways allow guests to log in to the Internet using their Facebook account. Facebook login provides an easy way to authenticate guests on to the network as well as giving the hotspot owner the opportunity to market their business and increase the number of returning customers. When a guest connects to the Wi-Fi hotspot they will presented with a login page. The login page can provide the option to log in using a Facebook account. Other options such as providing an email address can also be offered. The guest will be asked to log in. If the guest is already logged into Facebook on their computer they will bypass the Log In button and be presented with the Like button. If a guest is not already logged in a pop-up window will appear with the standard Facebook login prompt. At this point the guest is passing their details to Facebook servers using encryption (https). Once the guest has logged into Facebook they will be presented with a Like button. 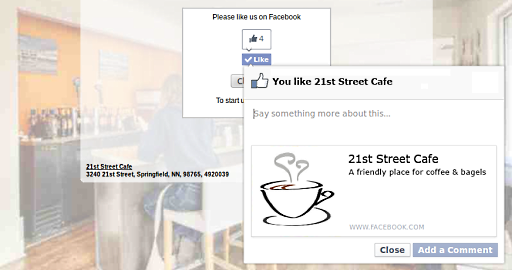 The click on the Like button will increase the Like count for the hotspot owner and promote the hotspot business. After clicking on the Like button the guest will have the opportunity to share the hotspot business with their friends. The hotspot owner will be able to promote their business to the guest by having their posts appear on the guest's Facebook page. The guest is now free to use the Internet and will either be forwarded to the page they had originally tried to visit or to a page selected by the hotspot owner. 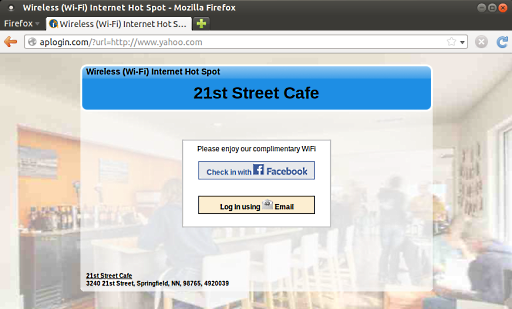 Facebook login is easy to set up on the Guest Internet hotspot gateways. Once a login page has been set up and Facebook has been selected as the login method the gateway is ready to start offering a Facebook login. A Facebook page must be created for hotspot guests to like. Once the page has been set up the URL of the page must be entered into the gateway. Every time a guest uses the hotspot gateway with their Facebook login their name and a link to their Facebook page will be added to the gateway's Usage Reports page. Facebook also provide a reporting tool called Insights which can be used to track access to the Facebook page as well as the number of Likes and posts to the page. 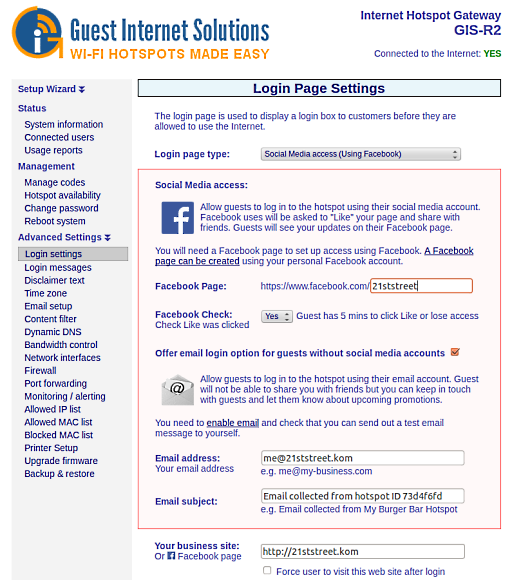 For guests without a Facebook account the hotspot owner can also offer an email login, and an email with the login data is delivered to hotspot owner each time a guest uses their email address to access the Internet. 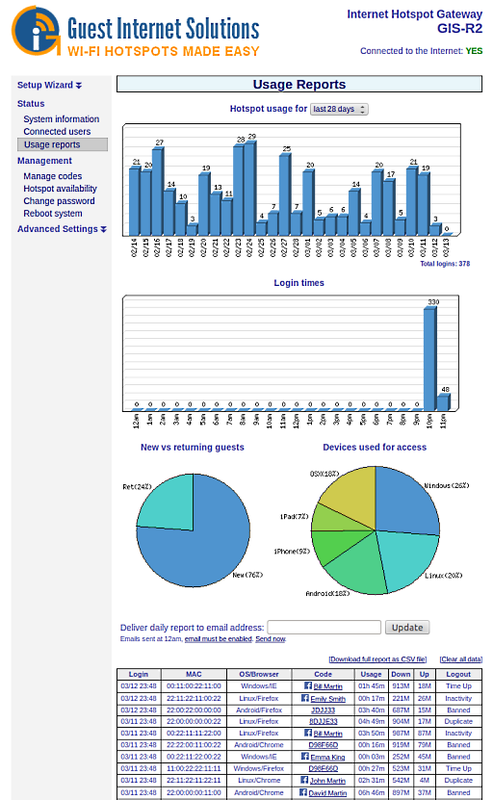 Usage reports can also be found on the Guest Internet hotspot gateway. The hotspot gateway provides four graphs detailing usage per day, per hour, per device type and also on the percentage of returning visitors. A table showing the data is also displayed. The table contains the names of the guests using Facebook access as well as a link to their Facebook page (you will only be able to see their public profile). The table also displays details like Internet access duration and the amount of data used (downloaded and uploaded to the Internet). Raw data can be downloaded as a CSV (Comma Separated Values) file and imported into Microsoft Office Excel or into a database. The hotspot gateway keeps 30 days of logs so reports should be downloaded periodically. There is an option to have a daily email delivered to the hotspot owner with access details.